A native of London, Ontario, Albert Templar meticulously recorded the changing streetscapes of his hometown. 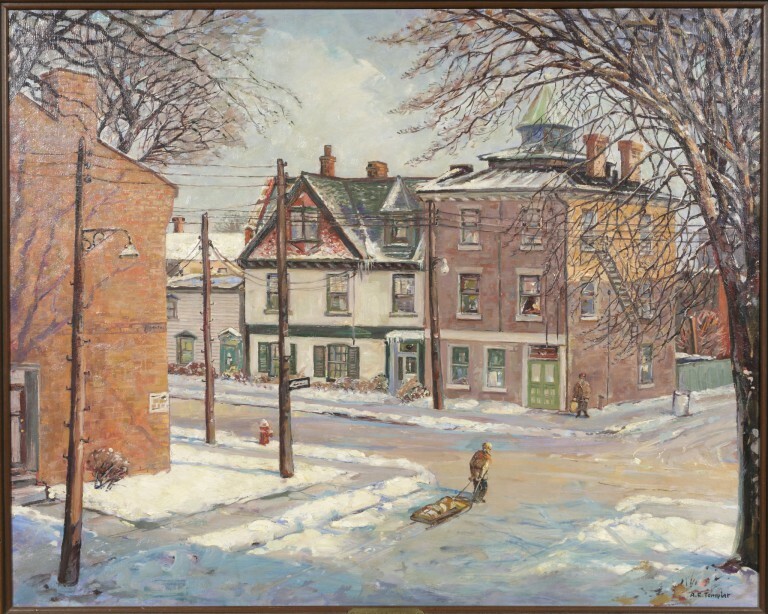 Not long after he captured this view of Ridout and Carling Streets, Carling was stopped at Talbot Street and the structures cleared. Government buildings would eventually be built in their place: the new Middlesex County Courthouse (1974) and a federal building housing the Canada Revenue Agency. From his high vantage point on the wintry scene, Templar depicts a quiet view undisturbed by the changes to come. But even in 1954, the intersection held memories of vanished streetscapes. In 1833, the corner of Carling and Ridout was home to London’s first Methodist Church. In 1844, the Bank of Montreal opened a branch there. And by Templar’s time, the area combined residential and commercial buildings. Templar’s Condominium Construction, 600 Talbot St., London, Ont. (c. 1980) is an interesting companion piece to this painting. Located near his longtime studio at 607 Talbot, this construction site served as dramatic evidence of change—and historical erasure. Templar was also an accomplished portraitist. Elizabeth (c. 1945) and Self-Portrait (c. 1927), both part of Museum London’s collection, show his ability to convey subtle expression and impart a distinctive personality to his subjects.